Emanuel Steward, revered as one of the best trainers in boxing history and whose Kronk Gym symbolized Detroit's gritty, blue-collar boxing scene and produced numerous world champions, died Thursday after a short illness. He was 68. Steward, who also managed many of the fighters he trained, worked with more than two dozen champions during his decades-long career. A younger generation of boxing fans knew him as an expert analyst on HBO's boxing telecasts. Victoria Kirton, Steward's executive assistant, told the Associated Press that Steward died in a Chicago hospital Thursday afternoon. AP Photo/Kerstin Joensson Emanuel Steward, who produced numerous world champions as one of boxing's great trainers and owned the famed Kronk Gym, died Thursday at 68. Often called the Godfather of Detroit boxing, Steward was a beloved figure because of his outgoing personality, seemingly endless energy to talk about boxing with anyone who would approach him and his dedication to his fighters. As a cornerman, he commanded respect because of his strategic genius and for having the knack to say the right thing at the right time during the heat of battle. Fighters also loved him for his generosity and for the father-figure role he often played in their lives. Training fighters was not just a job for Steward. He often took fighters in to live with him in his Detroit home, training them by day and parenting them by night. Steward was most closely identified with his work with three superstar fighters: multi-divisional world champion Thomas Hearns, who was with Steward from the beginning, former heavyweight champion Lennox Lewis and reigning heavyweight champion Wladimir Klitschko. Steward kept his usual busy schedule through the summer, training middleweight contender Andy Lee -- who lived with Steward -- for his loss to Julio Cesar Chavez Jr. on June 16, and Klitschko for his title-retaining sixth-round knockout win against Tony Thompson in their July 7 rematch. But he had been hospitalized since September, causing him to miss two HBO broadcasts, and underwent surgery. His sister, Diane Steward Jones, said the surgery was for the stomach disorder diverticulitis, although many others who knew Steward said it was for advanced cancer. "There are no adequate words to describe the enormous degree of sadness and loss we feel at HBO Sports with the tragic passing of Manny Steward," HBO Sports president Ken Hershman said. "For more than a decade, Manny was a respected colleague who taught us so much not only about the sweet science but also about friendship and loyalty. His energy, enthusiasm and bright smile were a constant presence. Ten bells do not seem enough to mourn his passing. His contributions to the sport and to HBO will never be forgotten. Our thoughts and prayers are with his family." Born in West Virginia on July 7, 1944, Steward became interested in boxing at age 8 after he was given a pair of boxing gloves. When he was 12, he moved with his mother to Detroit and began training at Brewster's Gym, the famed gym that produced the great Joe Louis. As an amateur fighter, Steward compiled a 94-3 record and won a 1963 National Golden Gloves title as a bantamweight. But his calling was as a trainer, not as a fighter. Although Steward was schooled as an electrician, he began coaching amateur fighters as a part-time coach in 1971 at the Kronk Gym, which he helped transform from the basement of a community center into a breeding ground for professional champions, who would walk to the ring wearing the unmistakable red and gold Kronk colors. In 1977, he led one of those amateurs into the pro ranks. It was Hearns, who became a star and with whom Steward found fame and glory. But there were other important fighters, too, including Hilmer Kenty, who became Steward's first professional champion in March 1980 when he won a lightweight world title by stopping Ernesto Espana in the ninth round at Joe Louis Arena in downtown Detroit. Five months later, Hearns destroyed Pipino Cuevas in two rounds to win a welterweight title. For the next 30-plus years, Steward had a constant stable of champions, some of whom he was with from the early days of their careers and some more established fighters who sought him out because of his reputation. Other champions he trained at one time or another included Mike McCallum, Jimmy Paul, Michael Moorer, Dennis Andries, Milton McCrory, Duane Thomas, Gerald McClellan, Evander Holyfield, Oliver McCall, John David Jackson, Julio Cesar Chavez Sr., Oscar De La Hoya, Naseem Hamed, Jermain Taylor, Chad Dawson, Miguel Cotto, and Cornelius "K9" Bundrage. Steward trained McCall when he knocked out Lewis to win a heavyweight title in 1994 in a huge upset and then took over Lewis' corner in 1995. He was in Lewis' corner when he stopped McCall in their 1997 rematch to regain the title. Steward and Lewis went 16-1-1 together before Lewis retired as champion in 2004, but they remained close. "I'm completely devastated by the passing of my long time friend, mentor and trainer Emanuel 'Manny' Steward," Lewis said in a statement. "Manny has helped me get through some of the biggest fights in my career and I only regret that I couldn't return the favor and see him through his biggest fight. "We've maintained a close relationship and the last time we spoke he seemed his usual upbeat self so it was very disturbing to hear about his illness and rapid decline. It is with a heavy heart that realization of what I hoped were just rumors are now in fact true. Manny always told me I was the best, but the truth is, he was the best and I'm grateful, privileged and honored to be counted among his many historic successes. ... We've truly lost one of its crown jewels. Manny was giving, selfless, compassionate and stern. He always gave back to the community and never forgot where he came from. He was an institution unto himself and I'm proud to have had him in my corner for so many years. "I'm extremely grateful for the time that I was given with him and he will be severely missed by all who knew and loved him. I'll miss his smile, his frank no-holds-barred truthfulness and our discussions on boxing and life. My prayers and condolences go out to his family at this very difficult time." Klitschko, who is training in Austria for a Nov. 10 title defense against Mariusz Wach, knew the gravity of Steward's illness and was forced this week to announce a replacement for Steward for the fight, tapping Steward disciple and pro heavyweight Johnathon Banks, a Kronk Gym product. "(My brother) Vitali and I, along with the entire Team Klitschko, send our deepest and most heartfelt condolences to Emanuel's family and friends," Wladimir Klitschko said in a statement. "It is not often that a person in any line of work gets a chance to work with a legend. Well I was privileged enough to work with one for almost a decade." Steward began working with Klitschko in 2004, and their first fight resulted in a knockout loss to Lamon Brewster. But under Steward's steady hand, Klitschko rebuilt himself into a heavyweight force and one of the most dominant heavyweight champions in history. Steward got a lot of the credit for helping Klitschko mentally as much as he did for training him physically. Klitschko and Steward shared a close bond that went deeper than simply trainer and fighter. "I will miss our time together," Klitschko said. "The long talks about boxing, the world, and life itself. Most of all I will miss our friendship. Rest in peace Emanuel. You will be greatly missed. "My team and I will carry on with the goals we had set while Emanuel was with us because that is exactly what Emanuel would have wanted. I know he will be with us in spirit along the way and we will accomplish these goals in his honor. Until we meet again my friend." Steward trained then-welterweight champion De La Hoya in 1997. "It brings me great grief and sadness to hear of the passing of one of the best and most respected trainers of this era, Emanuel Steward," De La Hoya said. "I learned a lot from him during our professional relationship and I will be forever grateful for his help during that time. We were also friends and I know I am going to miss him as so many others will too. He was an important part of our boxing community." Top Rank promoter Bob Arum was a friend of Steward's since the 1980s and promoted many of the fights involving the fighters he trained. "We are all grieving the passing of our friend Emanuel Steward," Arum said. "His founding and leadership of the Kronk Gym in Detroit was outstanding. His efforts produced many world class fighters and champions including Tommy Hearns, Milt McCrory, Michael Moorer and many more. 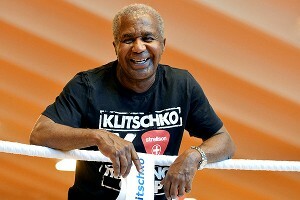 Emanuel Steward always stood for the best that boxing could offer. He will be missed by all of us." Although Steward was part of many big wins, he had his share of hurtful defeats. None stung him more than when Hearns was knocked out in the 14th round by Sugar Ray Leonard in the memorable 1981 welterweight championship fight. Steward said it was the most painful experience of his life, boxing or otherwise. He was also hurt by the third-round knockout loss Hearns suffered against Marvelous Marvin Hagler challenging for the middleweight title in their all-time great 1985 showdown. Steward was inducted into the International Boxing Hall of Fame in 1996. "Without a doubt, Emanuel Steward was one of the most accomplished and respected trainers in the history of boxing," said Ed Brophy, executive director of the Canastota, N.Y., shrine. "He was a great ambassador for the sport, always promoting boxing wherever he traveled. The Hall of Fame joins the worldwide boxing world in mourning the passing of a legend." Brophy said the flags at the Hall of Fame would fly at half-staff in his memory. Steward was named trainer of the year by the Boxing Writers Association of America in 1993 and 1997. The BWAA voted him manager of the year in 1980 and 1989.